SugarHouse Sportsbook — one of the first New Jersey sports betting apps to launch — hails from Philly. Read on for more about what you will find on the sports betting platform from SugarHouse Casino. Once a player registers for their new account and makes an initial deposit, they are already up a significant amount of money without placing a single wager. Why? SugarHouse has one of the most generous deposit matching bonuses in the business. How do you get it? First, sign up with our exclusive link. Then, when placing an initial deposit, players can use the code “250Match” to receive a dollar-for-dollar match of up to $250. Most sportsbooks top out at $100 or less. The bonus money becomes available within 48 hours, and as long as it’s wagered within 30 days along with the initial deposit, the entire sum can be withdrawn as player winnings. Any bonus money that is not wagered within the first 30 days is forfeited back to SugarHouse. Note: Wagers on heavy favorites (those with odds greater than -200) do not count toward the wagering total. Get your $250 deposit bonus right now at SugarHouse! Gamblers in New Jersey and the surrounding area are likely familiar with the SugarHouse Casino in Philadelphia. If those gamblers enjoy sports, they are probably aware that sports betting in New Jersey are now legal following a Supreme Court ruling in May, which permits states to legalize sports gambling without interference from the federal government. It’s no surprise that these two prominent gaming names, assisted by tech company Kambi, have combined their experience and reliability to bring the citizens of New Jersey, the new SugarHouse Sportsbook, now live and fully operational. The SugarHouse sportsbook app – available for Android and iOS (iPhone and iPad) devices – is a fully mobile and integrated version of the website. For players, the transition from one platform to the other is seamless as both versions share the same setup and functions. If a player prefers to go fully mobile and ditch using the website altogether, their experience will not suffer. From registering a new account, depositing or withdrawing funds, to filling out a bet slip and engaging in live in-game wagering, all the sportsbook’s features are accessible from a mobile device. Just as with the website, location services must be activated as wagers can only be placed from within the borders of New Jersey. If a player encounters any issue while using the sportsbook on their mobile device, or if the app incorrectly locates them outside of New Jersey state lines, SugarHouse provides support by phone, email and online chat. In spite of SugarHouse’s newness, they delivered an intuitive registration process. A new user only needs to submit their name, address, email, date of birth, phone number, and the final four numbers of their Social Security number. 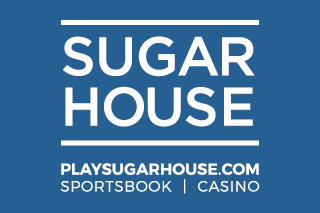 Unlike some other online sportsbooks, SugarHouse does not require photo identification. New players need to choose a unique username and password as well as answer two security questions. Users also have the option of turning on two-factor authentication for a final layer of security. You can sign up from either the app or the website. To create a new account, players need to be at least 21 years old and cannot appear on New Jersey’s exclusion list, which includes players, coaches, trainers, officials and anyone working in the sports’ world who can influence the outcome of an event. If an individual works in ticket sales, public relations or other position who cannot impact results, they are eligible to register. A player does not need to be a New Jersey resident to create a new account. However, to place bets or deposit funds, the bettor must be physically located within the borders of the state, and geolocation services should be enabled on their mobile device. All other functions on the website – from registration to depositing funds and withdrawing winnings – can be accessed regardless of location. Live in-game wagering is the latest rage in sports betting. It allows players to place bets on events that have already started. Those events have constantly shifting odds and point spreads based on the score and time remaining. SugarHouse asserts that the sportsbook’s technology allows in-game bets to stay open later into the game, giving players more chances to place them. Along with this innovative offering, SugarHouse also stacks up to the tried-and-true favorites, such as straight bets, parlays, propositions, teasers and futures. Players can also “cash out” their bets before a game is over, leaving the wager early and pocketing partial winnings. SugarHouse offers its players free membership into its point-based loyalty iRush Rewards program and the 11 tiers of benefits. Points are earned according to the amount wagered. All points remain available for 30 days, while tiers are determined by the number of points earned over a 60-day rolling period. With as few as 40 points, new members rise to the second tier, while 20,000 reward points are required to reach Tier 10. Tier 11, the top of the iRush Rewards Program, is available by invitation only. Even at the lowest tier, members of the rewards program can access the iRush bonus store where they can exchange points for bonus wagers. Higher tiers come with free plays, multipliers on wagers and customized deposit assistance. Be it baseball, football, hockey, basketball or even golf – SugarHouse has an offer on it all. In the sportsbook’s Big Game Getaway Sweepstakes, the grand prize consists of accommodations, dinner and two VIP tickets to the sporting event of the winner’s choice. Cash prizes are awarded to the top 15 drawings that don’t take home the grand prize. For every 50 iRush points added to a bettor’s account through sports wagering, they are awarded one entry into the drawing. SugarHouse Sportsbook also runs a jackpot parlay, which can be played like a quick pick lottery card. Players can let the computer randomly select winning bets in eight different sporting events, and if they hit on all eight, the winnings can top $100,000. Alternatively, participants may choose their eight winners themselves – also like a lottery card. One final way to make a bonus is by following SugarHouse on social media, including Twitter, Facebook, Instagram and YouTube. Each new follow can result in bonus rewards. The SugarHouse trend of user-friendliness extends to the many ways a player can deposit money to their account. The sportsbook considers online bill pay to be the most convenient and fastest method. A player only needs an online banking account – unlike with direct bank transfers, there is no need to submit a bank account number. This service has been arranged with 14 area and national banks and comes with a limit of $1,500 a day and $3,500 a week. SugarHouse provides fewer withdrawal methods than deposit options, and although withdrawing times are considerably longer, the process is just as straightforward. Money can be withdrawn through Neteller, PayPal and the SugarHouse’s prepaid card. Players can also request an e-check to be deposited into their bank account. This option comes with a three-to-five-day delay in processing. Personal checks are also an option, although they take up to two weeks to process. SugarHouse Sportsbook offers a wide variety of options for any sports betting. Coupled with a solid deposit bonus and a reliable mobile app, the NJ sports betting offering from SugarHouse is worth checking out.